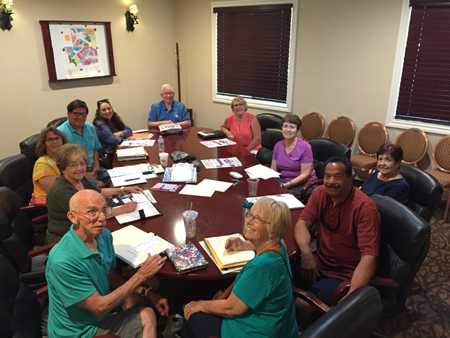 The Board of Directors meets monthly to discuss various agenda items regarding the 6 kitchens providing services of a hot meal served to each of the guests numbering about 1200 per month. After 6 months at another church site, we were asked to find another location. 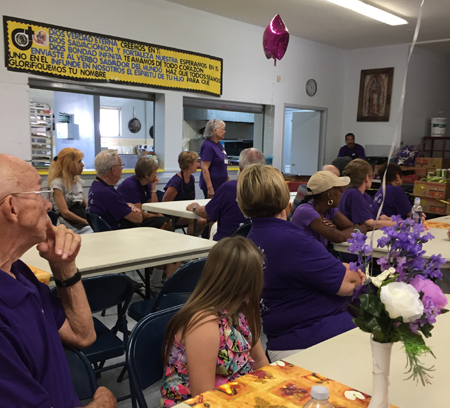 St. Kateri Parish dining room in Banning offered its facility to meet this need. In preparation for the July 17th opening of the new site volunteers painted the dining room, kitchen and cleaned the facility. The opening meal served 173 guests. Noteworthy is that while there are two paid employees all remaining workers are volunteers with the ministry relying on donations for food and supplies. The Franciscan Federation of the Third Order (Brothers and Sisters) join annually holding a Federation Conference. During the gathering a special Peacemaker Award honor is presented to a member whose individual Community has cited her/him as exemplifying the specific theme selected for that year . 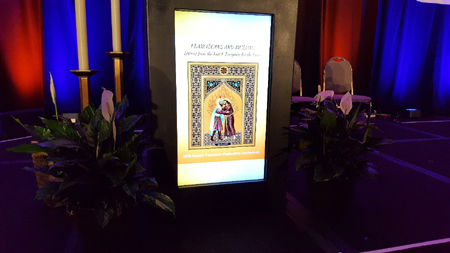 The theme for this year's Conference was "Franciscans and Muslims: lessons from the Past and Prospects for the Future". The USA Province chose to recognize Sister Joanne Riggs for this Peacemaker Award. 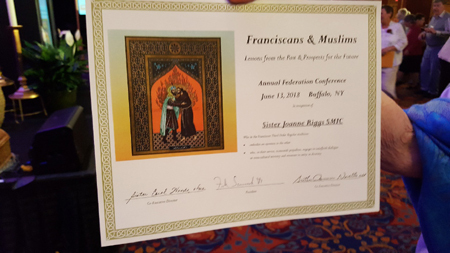 Joanne met the criteria for selecting a nominee: a Franciscan who embodies and openness to the other and someone who, in their service, transcends prejudices, engages in interfaith dialogue or cross-cultural ministry and witness to unity in diversity. The following is a summary of what the sisters named as the reason for nominating her for this Peacemaker Award. "Sister Joanne Riggs, smic, has been active in Interfaith dialogue as a member of the Archbishop's (Newark) Commission on Interreligious Dialogue through ongoing conversations with Islamic leaders in Passaic County, She has also been appointed as an attendee to the Parliament of World Religions. Through her efforts she has raised the consciousness of her sisters regarding Islam, the need and value of interfaith dialogue, and the needs of Muslim refugees. Where ever she has lived and worked she has brought needed information and health services as a professional nurse, to not only the Muslims, but the homeless and undocumented persons and to those speaking languages other than English. She has stood staunchly against prejudices toward the Muslim community in conversations, committee work, and Christian/Muslim dialogue both as participant and organizer. She has been a voice of conscience for years in the north New Jersey area where prejudice against so many of the above mentioned is rampant. As a Franciscan she embodies the spirit of Francis through humble service, a wry sense of humor, and a spirit of joy and leadership skills as she exhibits the desire: "that all may be one." During the Franciscan Peacemaker Banquet, on June 13, 2018, over 50 sisters and brothers were recognized by their Congregations and received the Peacemaker Award. Throughout the conference a power point with a peacemaker photo as well as photos that were taken to show how they are active in the ministry specifically with the conference theme was continually rolling for all the participants to see. 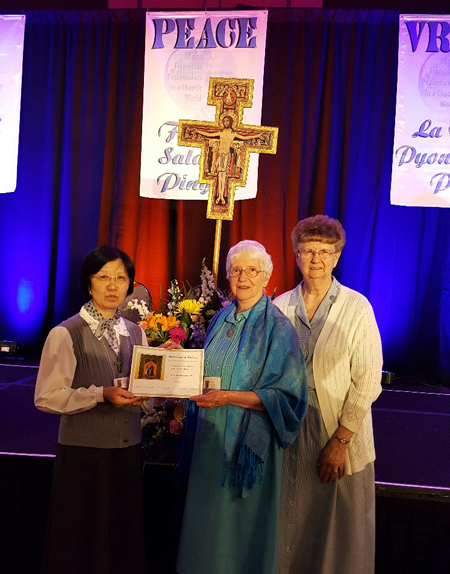 Though Sister Joanne was not able to be present at the conference or Peacemaker Banquet, Sisters Beatrice Yang, Saundra McKeta, and Eleanor Goekler attended and when Joanne's name was called, Sister Eleanor accepted the Peacemaker Award in Sister Joanne's name. We are grateful to Sister Joanne for all of the good work that she does especially in the area of the Muslim-Christian Interreligious Dialogue. Providing a contemplative compassionate presence to all, especially the most needy.